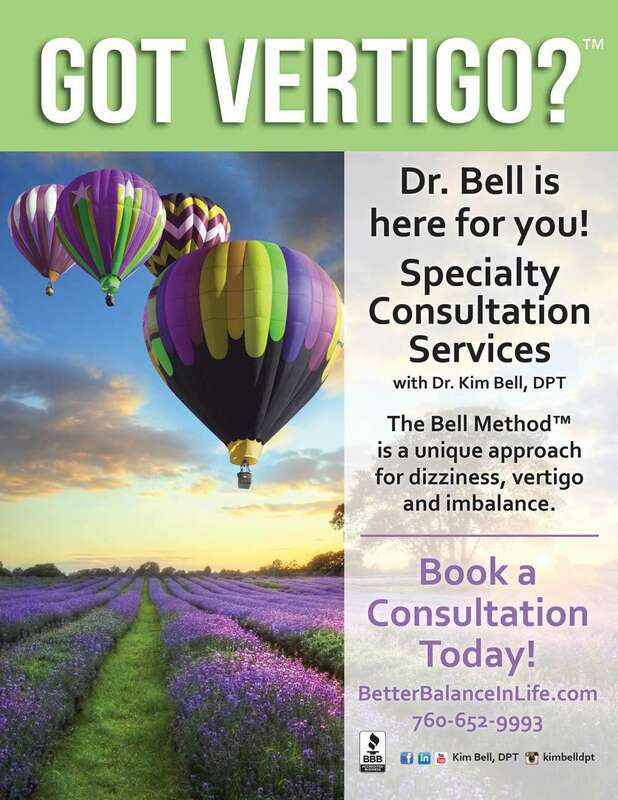 All contents of VertigoDetective.com, BetterBalanceInLife.com and its affiliates are Copyright © 2018 Dr. Kimberley Bell, DPT. The information contained herein is not meant as a substitute for medical advice from a medical doctor. Since everyone’s health is unique, it is recommended that you consult with your physician on your specific situation before implementing any specific recommendations given by Dr. Kimberley Bell, DPT or BetterBalanceinLife.com. Dr. Bell offers a website for educational purposes only. Nothing contained on or offered by or through this website should be construed as medical advice and should not be relied upon for medical diagnosis or treatment. All users are advised to seek medical consultation individually for appropriate recommendations. Kimberley Bell, DPT provides continuing education courses, clinical support, information and consultation in a good faith attempt to help. However, no course of study or consultation service can guarantee success, results, or improved performance. Therefore, Kimberley Bell, DPT cannot guarantee specific outcomes and cannot be held accountable for such. All clinicians continue to practice under the rules and regulations of their own individual healthcare providers license. Kimberley Bell, DPT reserves the right to, at any time, for any reason, discontinue services for clients or patients without penalty or recourse. Any payment made for future services that are not received will be returned, unless they expire according to the terms of prepaid consultation services and visit packages. THE MATERIALS AT THIS SITE ARE PROVIDED “AS IS” WITHOUT ANY EXPRESS OR IMPLIED WARRANTY OF ANY KIND INCLUDING WARRANTIES OF MERCHANTABILITY, NONINFRINGEMENT OF INTELLECTUAL PROPERTY, OR FITNESS FOR ANY PARTICULAR PURPOSE. IN NO EVENT SHALL KIMBERLEY BELL, KIM BELL PHYSICAL THERAPY INC., OR ITS AGENTS, AFFILIATES OR OFFICERS BE LIABLE FOR ANY DAMAGES WHATSOEVER (INCLUDING, WITHOUT LIMITATION, DAMAGES FOR LOSS OF PROFITS, BUSINESS INTERRUPTION, LOSS OF INFORMATION, INJURY OR DEATH) ARISING OUT OF THE USE OF OR INABILITY TO USE THE MATERIALS, EVEN IF KIMBERLEY BELL HAS BEEN ADVISED OF THE POSSIBILITY OF SUCH LOSS OR DAMAGES. Dr. Kimberley Bell, DPT does not, in any way, exclude or otherwise discriminate against any person on the grounds of race, religion, skin color, national origin, sexual orientation, age or disability in participation in, access to, or receipt of offered services. This statement is in accordance with the provisions of Title VI of the Civil Rights Act of 1964, Section 504 of the Rehabilitation Act of 1973, the Age Discrimination Act of 1975, and Regulations of the U.S. Department of Health and Human Services issued pursuant to the Acts, Title 45 Code of Federal Regulations part 80, 84, and 91, Title III of the Americans with Disabilities Act (ADA) and all other Federal laws and Regulations providing similar protection against discrimination. ALL CONTENTS ON THIS SITE ARE PROTECTED BY COPYRIGHT. EXCEPT AS SPECIFICALLY PERMITTED HEREIN, NO PORTION OF THE INFORMATION ON THIS WEB SITE MAY BE REPRODUCED IN ANY FORM, OR BY ANY MEANS, WITHOUT PRIOR WRITTEN PERMISSION FROM DR. KIMBERLEY BELL, DPT. VISITORS OR USERS ARE NOT PERMITTED TO MODIFY, DISTRIBUTE, PUBLISH, TRANSMIT OR CREATE DERIVATIVE WORKS OF ANY MATERIAL FOUND ON THIS SITE. The trademarks, logos and service marks (“Marks”) displayed on this Web Site are the property of Dr. Kimberley Bell, DPT. Users are not permitted to use these Marks without the prior written consent of Dr. Kimberley Bell, DPT, who own the Marks. Although Dr. Kimberley Bell, DPT has attempted to provide accurate information on the Web Site, she assumes no responsibility for the accuracy of the information. Dr. Kimberley Bell, DPT may change the prices, programs or products mentioned at any time without notice. Since global information is provided at this Web Site, not all programs or services mentioned will be available in your geographic region. Please contact Dr. Kimberley Bell, DPT via the “contact us” page for information as to programs and services available in your region. This Web Site may contain links to third party sites. Access to any other Internet site linked to this Web Site is at the user’s own risk and Dr. Kimberley Bell PT is not responsible for the accuracy or reliability of any information, data, opinions, advice or statements made on these sites. Dr. Kimberley Bell PT provides these links merely as a convenience and the inclusion of such links does not imply an endorsement of ongoing activities at the related websites and organizations. All current and future patients should refer to our HIPAA Notice of Privacy Practices. If you transmit to or post on this Web Site any material, data, information or idea by any means, it will be treated as non-confidential and non-proprietary and may be disseminated or used by us for any purpose. Personal data provided to us through this Web Site will be handled in accordance with our policies regarding privacy. Dr. Kimberley Bell, DPT may at any time revise these terms and conditions by updating this posting. By using this Web Site, you agree to be bound by any such revisions and should therefore periodically visit this page to determine the then current terms and conditions to which you are bound. Certain provisions of these terms and conditions may be superceded by other legal notices or terms located on parts of this Web Site. All course descriptions specify the intended audience for the content. Fitness professionals, yoga teachers, other geriatric healthcare providers and students may be present at certain courses. All information instructed in clinical continuing education courses is intended to be used within the scope of practice of each individual. In the interest of public safety and according to standards of ethical conduct, course content is not intended for the use of participants outside the scope of their license and regulation. The information in videos on this website is for educational purposes only. It is not intended to provide a medical diagnosis or substitute for medical advice. 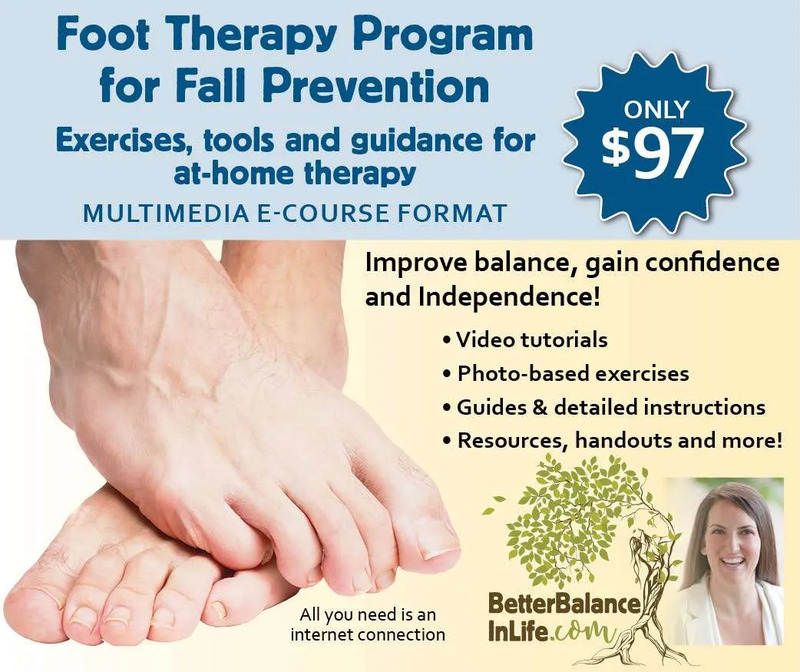 The Bell Method exercises in the E-course videos are intended for people who have balance problems to improve strength, body awareness, balance, blood flow and sensation. By attempting any of the exercises in the video, you do so at your own risk. It is normal to experience some soreness after doing an exercise you are not used to doing. If you have pain and your pain increases, moves to a different location or new or different symptoms arise after doing an exercise, you should stop the exercise and seek advice from a physician or physical therapist. We make no representations, guarantees or warranties that the information or exercises in this video are appropriate for you or will result in improvement of your medical condition or function. BY USING THE INSTRUCTIONAL VIDEOS AND ATTEMPTING THE EXERCISES IN THE VIDEOS, YOU AGREE THAT KIM BELL PHYSICAL THERAPY, INC. AND IT MEMBERS, EMPLOYEES OR AGENTS WILL NOT BE LIABLE TO YOU OR ANY THIRD PERSON FOR ANY INDIRECT, CONSEQUENTIAL, EXEMPLARY, INCIDENTAL, SPECIAL OR PUNITIVE DAMAGES ARISING FROM YOUR USE OR MISUSE OF THIS VIDEO WHETHER SUCH DAMAGES ARISE IN CONTRACT, TORT, NEGLIGENCE, EQUITY, STATUTE OR BY WAY OF ANY OTHER LEGAL THEORY REGARDLESS OF WHETHER SUCH DAMAGES COULD HAVE BEEN FORESEEN.